Picadillo is a dish from Spain. It contains highly seasoned, slightly sweetened, ground fried meat. 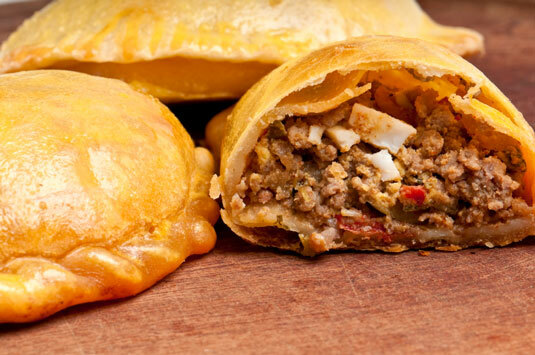 In addition to making an excellent stuffing for these little turnovers, you also can use picadillo to stuff chiles for baking, to fill tacos, or to simply serve alongside rice and beans. You can make the dough recipe a few days ahead and refrigerate it. Brown the ground beef in a large heavy skillet over medium-high heat, stirring frequently, about 7 minutes. Drain off and discard the excess fat. Add the onion and sauté for 5 minutes. Then add the garlic, raisins, olives, salt, pepper, cumin, cloves, and brown sugar, if desired. Cook until their aromas are released, about 2-1⁄2 minutes. Stir in the Red Roasted Tomato Salsa, bring to a boil, and set aside to cool. Roll out the dough and cut into circles as described in the following recipe. Place a generous tablespoon of the beef filling in the center of each pastry round. Brush the pastries all over with the egg wash and arrange in a single layer on a baking sheet. Bake until golden, about 15 minutes. Combine the flour and butter in a large bowl. Lightly blend with your fingertips until the butter is evenly distributed in chunks. Dissolve the salt and sugar in the water and stir into the flour mixture. On a lightly floured surface, turn out the mixture and lightly knead the dough until it forms a ball, adding a bit more water if necessary. Knead by pushing the ball of dough away from you with the heel of your hand, and then gathering it up, and making a quarter turn before repeating. Wrap in plastic and refrigerate for at least 1 hour or freeze as long as a week. Return to room temperature before rolling. Divide the dough in half. On a floured board, roll out half the dough to a thickness of 1⁄8 inch. With a cookie cutter or a drinking glass, cut out 4-inch circles. Gather the scraps, add to the remaining dough, and reroll and cut out circles until all the dough is used. For cocktail-sized servings, we sometimes make empanadas into tiny bite-sized pieces. When cutting out the dough, make sure that each circle is large enough to stuff. You want each bite to contain both meat and pastry. A 3-inch circle is just the right size. Roasting the tomatoes until blackened gives this smooth red sauce its distinctive Mexican flavor. Place the tomatoes, garlic, chiles, and onion on a foil-lined baking tray. Drizzle with the olive oil. Broil 6 to 8 inches from the flame for about 12 minutes, turning frequently with tongs, until evenly charred. Transfer the vegetables and any accumulated juices to the blender or food processor. Add the tomato juice, salt, and pepper. Puree, in batches if necessary, until smooth. Pour into a medium saucepan. Bring to a boil, reduce to a simmer, and cook, uncovered, for about 5 minutes. Season with salt and pepper. Cool to room temperature for table salsa, or use warm as an ingredient in rice or chilaquiles. Store in the refrigerator for 2 to 3 days, or in the freezer for 2 weeks. For the lazy cook’s version of this salsa, you can use canned Roma tomatoes and totally skip the broiling part. The salsa still tastes delicious, though definitely not roasted. A chile-intensive sauce, such as this one, is a terrific complement to any red meat — grilled steaks, lamb chops, or burgers are great. If all three types of chiles aren’t available, improvise according to your taste. Arrange the onion, garlic, tomatillos, and chiles on a baking sheet. Drizzle evenly with the olive oil. Broil 6 to 8 inches from the flame, turning frequently with tongs, until evenly charred, about 12 minutes. Transfer to a food processor and pulse until finely chopped. Add the lime juice, oregano, and salt and process until smooth. Serve at room temperature or chilled. Store in the refrigerator for up to 4 days.